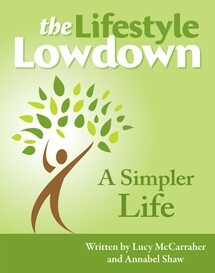 Tips and Tools for maintaining a simpler life. For the past few years, many of us have been on the ‘go, go, go, get, get, get’ treadmill – and ‘having it all’ has often simply meant ‘doing it all.‘ But now outside events have forced some of us to pause and ask: Is more better? Is busy is best? Is it all worth it - or is there a simpler, more satisfying way to live? Through a series of integrated, enjoyable exercises, work/life balance experts Lucy McCarraher and Annabel Shaw provide a map for the listener to embark on a journey to re-discovering genuine values, needs, desires and hopes, providing positive and well-defined goals, clearly marked destinations, a planned itinerary and regular signposts to keep the listener on track. Lucy McCarraher is one of the UK’s leading experts on work-life balance. She has been a consultant, trainer, speaker and coach in work-life balance and stress management. She does voluntary work for intercountry adoption (her two daughters were adopted from Russia) and is a director of a sheltered accommodation charity. Annabel Shaw trained as a research psychologist. She has taught psychology at Sussex University and at The Open University and she has also worked for Brighton and Hove Social Services. More recently Annabel, who is also a qualified radiotherapist, has worked with cancer patients at the Sussex Cancer Centre.